What do Elvis, Jerry Lee Lewis, Johnny Cash, and Bono have in common? 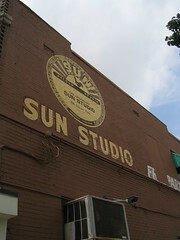 They've all recorded at the legendary Sun Studio, of course. This tiny building in Memphis houses the hallowed ground of many famous recording artists and still operates as a studio in the evenings! The tour begins with a fantastic montage of artifacts, video, and audio recordings to get the flavor of the early days of the recording studio. . . the tour guides are carefully dressed to reflect the times, and our guide presented her wealth of information with a Southern twang. The tour moves along to the original front office (where Elvis would check in for his appointments) and then to the studio itself. As a modern studio, it houses the latest audio/recording equipment and instruments, but the pictures on the walls took us back in time. Audio clips also offered a glimpse into the fun moments at the studio--imagine Elvis cracking up laughing in the middle of one of his takes because Carl Perkins was making funny faces through the front window. Well, it's been immortalized on tape. An "X" on the floor in electrical tape marks the spot where Elvis stood, so Roadchick B found it perfectly appropriate to play "Elvis Fanatic" and kiss the spot (while trying not to envision 1000's of other Elvis fans who have kissed the same spot). The front entrance is a gift shop (of course) and also a whimsical soda fountain. We made a last-minute decision to take this tour and it turned out to be one of the favorites of Memphis. This tour is highly recommended for music fans, Elvis fans, and fans of the 1950's alike--it has a little something for everyone. The Roadchix would like to salute Sam Phillips, the dreamer, schemer and founder of Sun Studio's and Sun Records. He passed away shortly after our visit in 2003 at the age of 80.